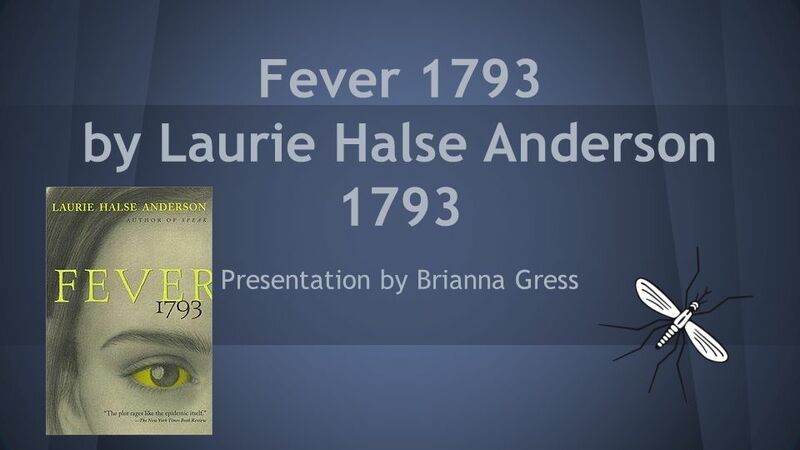 Fever 1793 by Laurie Halse Anderson 1793 Presentation by Brianna Gress. 4 Fever 1793 Matilda Cook,aka Little Maddie, lives in Philadelphia, and runs a coffee shop with her mom. Matilda’s dad died while building the coffee shop. They live a normal life until they hear that maddie’s friend, a assistant servant girl named Polly died of some sort of fever. 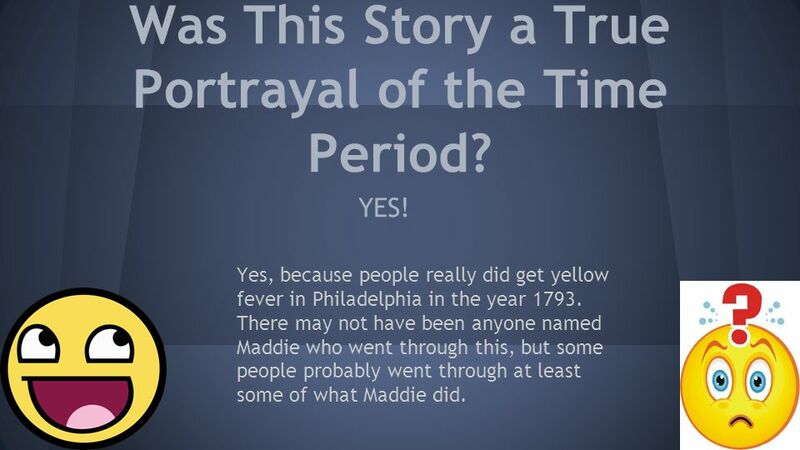 Then there’s rumors around the city that yellow fever came back, but maddie’s mom doesn't believe any of them. 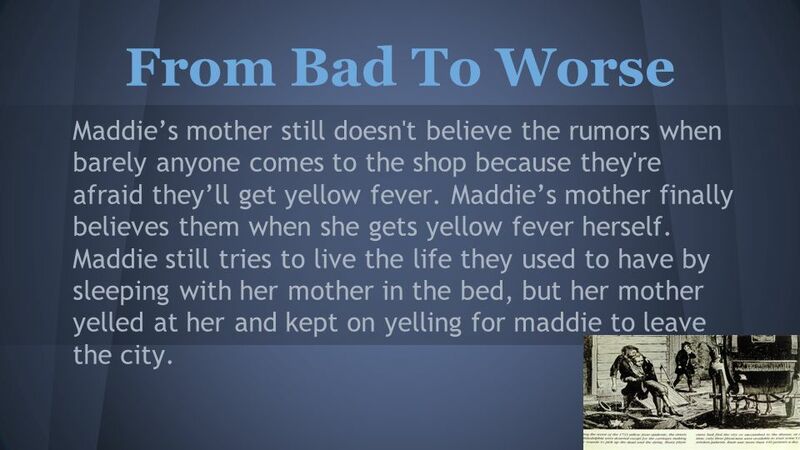 5 From Bad To Worse Maddie’s mother still doesn't believe the rumors when barely anyone comes to the shop because they're afraid they’ll get yellow fever. Maddie’s mother finally believes them when she gets yellow fever herself. Maddie still tries to live the life they used to have by sleeping with her mother in the bed, but her mother yelled at her and kept on yelling for maddie to leave the city. 6 Leaving Maddie’s mother finally got Maddie to leave the city. Maddie and her grandfather are riding in a carriage to a farm when they’re stopped on the way by patrols. 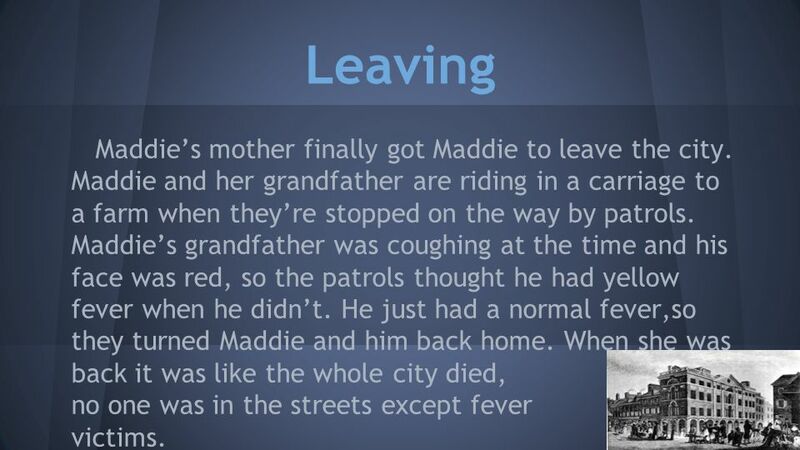 Maddie’s grandfather was coughing at the time and his face was red, so the patrols thought he had yellow fever when he didn’t. He just had a normal fever,so they turned Maddie and him back home. When she was back it was like the whole city died, no one was in the streets except fever victims. 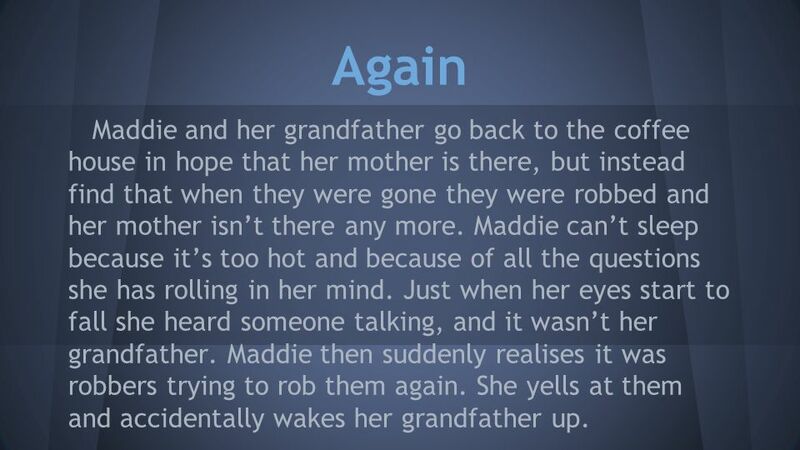 7 Again Maddie and her grandfather go back to the coffee house in hope that her mother is there, but instead find that when they were gone they were robbed and her mother isn’t there any more. Maddie can’t sleep because it’s too hot and because of all the questions she has rolling in her mind. Just when her eyes start to fall she heard someone talking, and it wasn’t her grandfather. Maddie then suddenly realises it was robbers trying to rob them again. She yells at them and accidentally wakes her grandfather up. 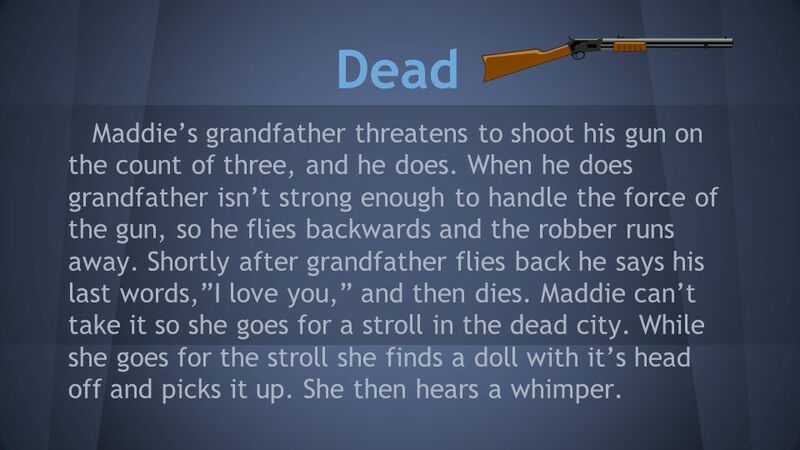 8 Dead Maddie’s grandfather threatens to shoot his gun on the count of three, and he does. When he does grandfather isn’t strong enough to handle the force of the gun, so he flies backwards and the robber runs away. Shortly after grandfather flies back he says his last words,”I love you,” and then dies. Maddie can’t take it so she goes for a stroll in the dead city. While she goes for the stroll she finds a doll with it’s head off and picks it up. She then hears a whimper. 9 Nell The whimper Maddie heard was a little girl from inside the house next to her. Maddie ran to house and asked if that doll was hers and what her name was. The girl said her name was Nell and that her doll was broken. Maddie then asked where her mom was. Nell said her mom was also broken. Maddie finds out her mother died from the fever when Nell takes her to her mom’s room. Maddie comes to love Nell like a mother would. 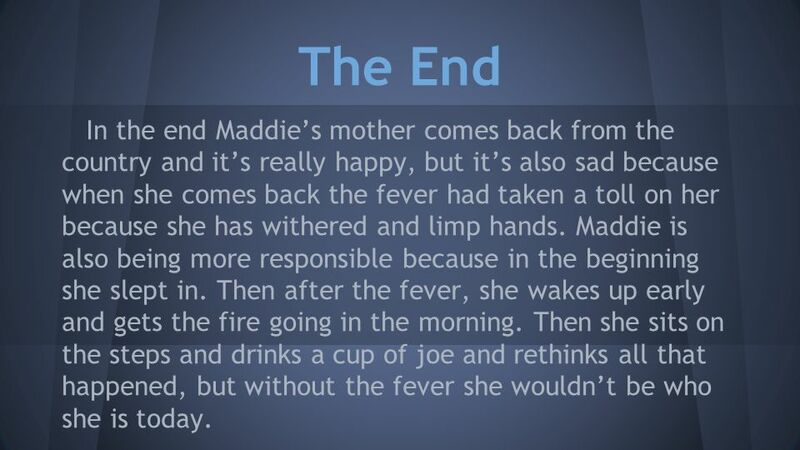 10 The End In the end Maddie’s mother comes back from the country and it’s really happy, but it’s also sad because when she comes back the fever had taken a toll on her because she has withered and limp hands. Maddie is also being more responsible because in the beginning she slept in. Then after the fever, she wakes up early and gets the fire going in the morning. Then she sits on the steps and drinks a cup of joe and rethinks all that happened, but without the fever she wouldn’t be who she is today. 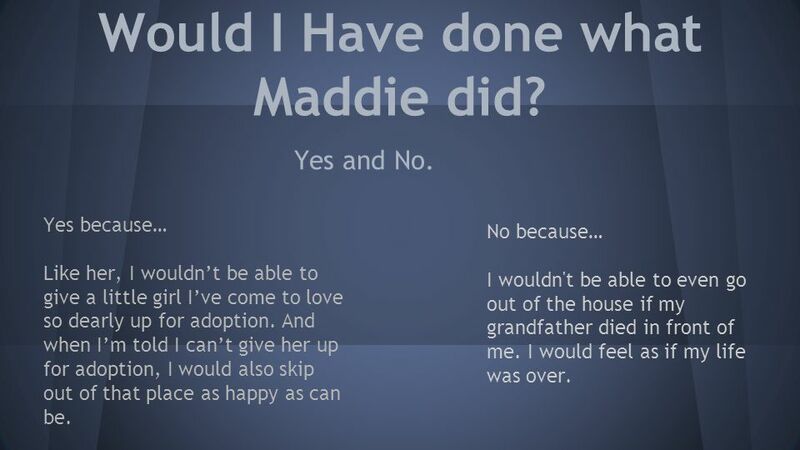 11 Would I Have done what Maddie did? Yes and No. Yes because… Like her, I wouldn’t be able to give a little girl I’ve come to love so dearly up for adoption. And when I’m told I can’t give her up for adoption, I would also skip out of that place as happy as can be. No because… I wouldn't be able to even go out of the house if my grandfather died in front of me. I would feel as if my life was over. 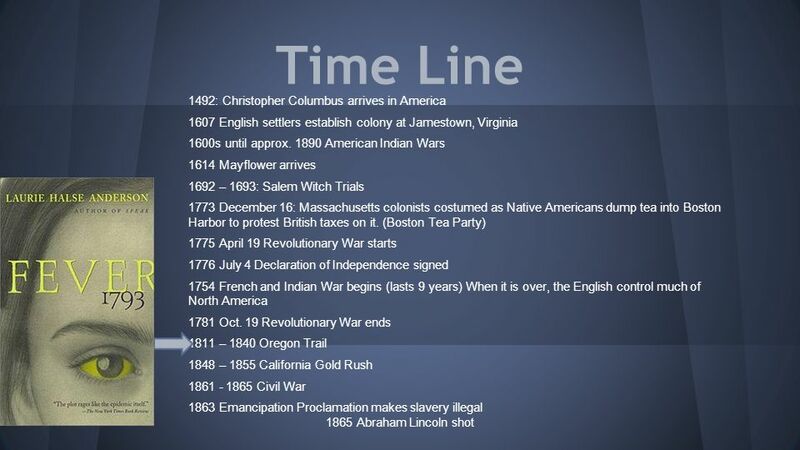 12 Was This Story a True Portrayal of the Time Period? YES! 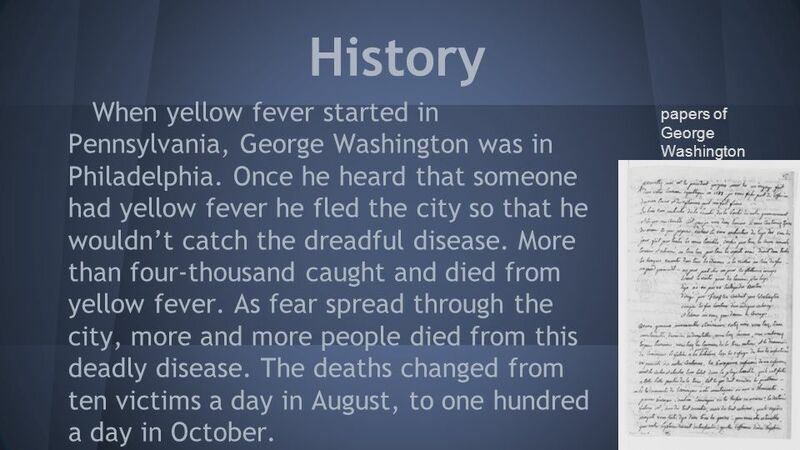 Yes, because people really did get yellow fever in Philadelphia in the year 1793. There may not have been anyone named Maddie who went through this, but some people probably went through at least some of what Maddie did. 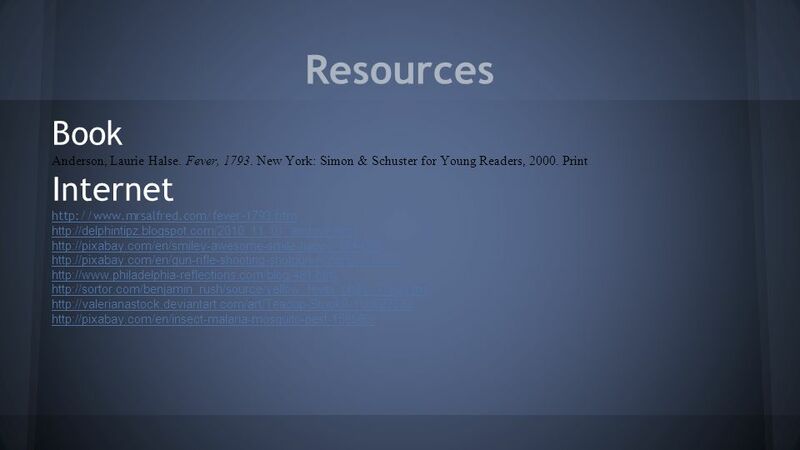 Download ppt "Fever 1793 by Laurie Halse Anderson 1793 Presentation by Brianna Gress." The Secret of the Rainforest By: Mark Halstead. The user begins using the application. Scene One: Children traveling to camp Intro Back Story – Why there. The Wrong Suitcase When the bombs started to fall these posters were on walls everywhere. Our parents said it wasn’t safe to stay in London – they said. The hallway at Butler County Middle School was empty because the bell to be in class had just rung, but the one person Jessie didn’t want to see, especially.
. Vypracovala: Mgr. Silvie Reitharová Some views from the US history. My name is Sky! By Lily Lui 6A CCC But San Primary School. This is beautiful! Try not to cry.